It’s ironic how I wait until the last three issues to check this book out. I’m going to let you in on something about me: Superman is my least favorite character of the Trinity (Batman, Superman and Wonder Woman). Yes, he has some good stories but he didn’t do it for me. It was Batman that got my attention because how can you not like a man of mystery.I can go on about this but there’s a book that needs to be reviewed. I bet you are wondering why did it take me eighty some odd issues to read Superman/Batman. Two words: Josh Fialkov. Fialkov has caught my eye as of late with ECHOES and TUMOR so seeing his name on this arc was a given to give it a shot. 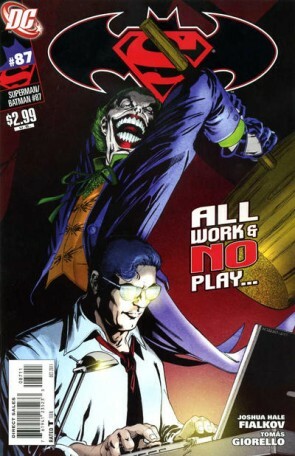 In this last issue of “The Secret” has the Joker going against Clark Kent while trying to prove Batman is innocent in the death of a reporter. Fialkov gets the dynamic of Superman and Batman. He got me interested in the book then DC had to cancel it in the mist of their reboot/relaunch. While I loved the story, the art by Tomas Giorello is a bit off at times but gets the tone of the story. I’m a little sad that it is the last issue of the series. Hopefully this gets collected in a trade and if it does, you should check it out.